Everyone seems to be agreed that the Istanbul circuit is one of the best tracks in the current calendar. It has elevation change and the wonderful turn 8, a couple of long straights and at least one spot where it should be possible to overtake. So it is disappointing that the major moment of excitement in the race came when a front tire exploded on Hamilton's car. With Kimi Raikkonen admitting again that the race was boring for him, we are left with little option but to agree. Interest came from matters not directly visible in the race, that blown tire creating a tightening of the points gap in the championship that leaves four drivers and two constructors in with realistic chances of the titles. Such a close battle between so many has not been seen for years. Otherwise, we have to look further down the field to find anything to ponder on. 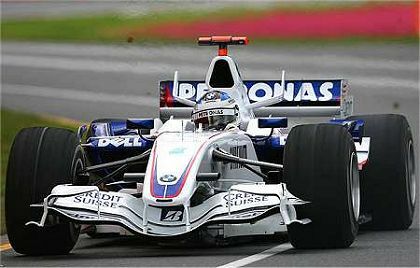 Kubica's early pit stop told us immediately that his speed in qualifying was thanks to a light car and that Nick Heidfeld remains the quicker driver in the BMW team. That may go against current thinking on the matter but, as I have pointed out before, the statistics show that Quick Nick still finishes ahead of his Polish team mate more often than not. Ignoring the struggle between team mates, BMW's decision to have Kubica on a light fuel load is a strange one. It enabled the Pole to qualify just ahead of Heidfeld but, from a race strategy point of view, it was a very poor decision indeed and probably made the difference between the BMWs finishing fourth and fifth rather than fourth and eighth. So why did they do it? Did they hope that Kubica could get amongst the top two teams on the grid and perhaps hold on to whatever race position resulted? It made sense to use Kubica for such a gamble since he is so far behind Heidfeld in the championship - they were risking little, therefore. Whatever the plan, it seems that BMW are a good deal more ambitious than Mario Theissen lets on in his public statements. They may profess to be happy with the third spot almost guaranteed them in the constructors' championship this year, but they want more and are determined to break the Ferrari/McLaren stranglehold in 2008. In the other veteran/newbie battle of the year, it appears that Kovalainen has won and Fisichella's future becomes ever more insecure. Fizzy is reliable and consistent but is no longer as quick as his Finnish team mate and the Flav's attention must be wandering to the other options available to him for the new season. Assuming that the world has not gone completely mad and Alonso will not be one of those options, the spotlight must turn to young Nelsinho Piquet. The Brazilian has been quite loud in his determination to be in a race seat next year and Kovalainen will provide both a more mature driver, having had this year as experience, and a useful yardstick to Piquet's performance. Briatore is due to announce the 2008 team soon so we will see whether my prediction is true. No need for me to say anything about Toro Rosso this time - I dislike stating the obvious anyway. But there was a humorous highlight to the weekend, way down amongst the struggling midfielders. When told over the pit/driver radio that Jenson was claiming to be two seconds faster, Rubens Barrichello responded wryly, "Don't make me laugh." And now we know what has enabled the Honda drivers to keep trying throughout such a frustrating season - it's humor. Finally, let us spare a thought for Mark Webber. It is adding insult to injury that the man who has suffered more mechanical breakdowns than anyone else over the past twelve months should be the only one to retire from the Turkish race. That's consistency, yes, but of a kind that no-one wants. I guess telling Rubins "Jenson said he is 2 sec faster" is a better than "You MUST let Micheal past". He seemed to listen a little better too because Button managed to pass him. Hah, very true, Dan. Poor old Rubens, will anyone ever let him forget those Ferrari years...? "Thoughts on the Turkish GP" ?????? Kimi got it right ............. "boring" ............ and that at a circuit touted as the best in F1. The answer of course ....... "It's the cars" and I see no one doing anything to resolve the situation. Drivers....I was ready to drop Heidfeld two years ago, he was scoring fewer and fewer points each year until Frank Williams gave Nick a second chance, actually he took him on as a bonus to BMW and a year later both were gone! Heidfeld is one of many that prove EXPERIENCED drivers are worth more that these stinking kids that are infesting F1 ranks. Fisichella is another who should not be brushed aside too quickly, replacing him with Piquet will NOT earn any more points than Fisi can earn, Renault ought to focus on the real problem....their car! Toro Rosso ...... have reset the clock, merely moved back to zero to start again. Don't bank any money on that team. I for one cheer for "Lil Ant" (Davidson), his team do a terrible job of qualifying, this race was his best start and he had the chance to really shine.......all he had to do was FOLLOW Trulli and Fisichella, they are fast enough to lead the way and keeping up with them would have been a good test for he and the Super Aguri, alas that 'test' ended early..... at turn one !!! 14th after the dust cleared and finished 14th unable to catch anyone. Now I've heard a rumor " Davidson to Toyota replacing Ralf". Let me ask, is a bad Toyota better than next years Super Aguri? What say you ...........? If it's on offer, I think Davidson should consider it, Number 38. Super Aguri have done incredibly well this year but how much better can they do, dependent on Honda as they are? They say they will build their own chassis next year but that only makes me think two things: either they're dreaming and will have to make do with a development from this year's chassis (I don't think they will want this year's Honda) or they will be starting from scratch with their own design - and that will inevitably take a long time to make effective. So Davidson would do well to think hard if he gets an offer from Toyota. There is always a chance they'll get it right and, even if they don't, their money assures that the car will run in midfield at worst. I must admit that I don't think Toyota will be making the offer anyway. They'll go for one of the much-hyped kids to team with the experience of Trulli. I agree, Milos, it does show how impossible it has become to overtake in modern F1. The FIA are trying to do something about it but I cannot help but feel they are merely nibbling around the edges. A more radical approach is needed.